In 2008, I put down Lawrence’s other alias Sten as my favorite album for that year, now i’m trying to dig deeper in his catalog for you to understand why Peter Kersten’s music is full of charm and delight. This unnamed track has soo much atmosphere, it makes me feel like Peter really gets to enjoy quiet days off and writes songs about calm scenery he sees. School Of Seven Bells did this unbelievable remix of my favorite Active Child song. Its like standing in windtunnel thats blowing soft flower pedals down it and also you can hear the original version playing and you have your eyes closed. One of the best records of the year just had the pleasure of being remixed by one of my favorite remixers from last year. Once it gets going it starts touching that epic Caribou sound that many people love I think. 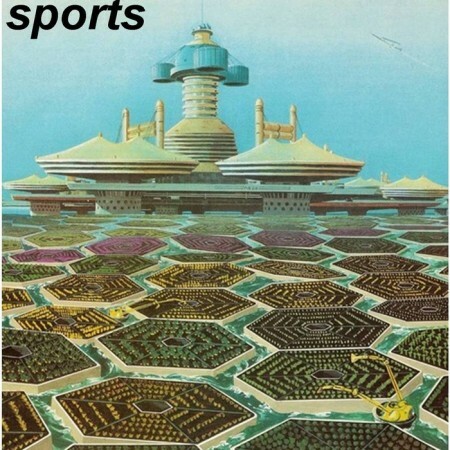 Honestly, I had to give this song a chance by Sports, look at that cover! I know they didn’t get the art made recently, there’s no way. I was surprised and happy to that I did check it out though, nice easy rock with muddy mid-tone elements that actually don’t sound that bad. Kolombo + Terje .. Revenge .. Tame Impala+Weed..
Just saw SPORTS play a house show on halloween and it was DOPE. Love the tracks. Saw SVIIB and Active Child in SLC last month. Any idea if and when that remix will see the light of day? That cover is from a children’s book on the future or something. I’ve seen it before. Whoa. I’m LOVING that SPORTS track. About to spam all of my buddies with links to their stuff. They have another track called “Every World is a World of Your Own” and it sounds just amazing. @Chester – Just found a link that says it’s something to do with a Walt Disney “The Future World of Agriculture” book or something to that effect. Found it here. I love Lawrence’s music. I came back to this site very often to look up the Sten track you posted from 2008. Oooh Pilooski and Tame Impala. 2 of my faves. This is abselutely fanstastic music. A confortalbe blend between electronica and house.